In the movement through the number cards, we now come to the Threes. Though there is a common pattern of evolution leading to challenge or crisis, we find the Threes to be something of a mixed bag- the Threes are a development from the Twos that proceeded them, but some have a more positive message, while others a message of challenge. The Threes have the common thread of representing the next development from the Twos, however- for better or worse. But again, they often represent simply a challenge, as we ourselves face challenges to development and growth. Remember that the Tarot, especially the number cards, are meant to mirror our daily lives. The number cards represent events in the cycle of that life. 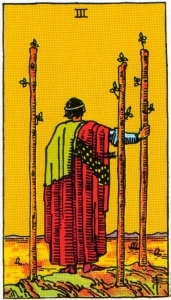 So first, let's examine the Three of Wands. The Three represents investing energy, willpower and direction into the path that was chosen in the Two of Wands. Having picked a direction, we now find that following that direction is needed. For the path to lead us anywhere, we have to walk it. Are the ships in this picture returning, or sailing out? Either way, they represent the development of an idea, and the return we will see on what we invest our energy in. I've found that the world always returns what we put into it. That's not necessarily a good thing, but always seems to be the case. This is also the "stick to it" card- when we've chosen the direction to take, made the decision, it's time to follow up with that decision, and follow through on it. If we ourselves fail to reach that decision, the decision can be made for us. 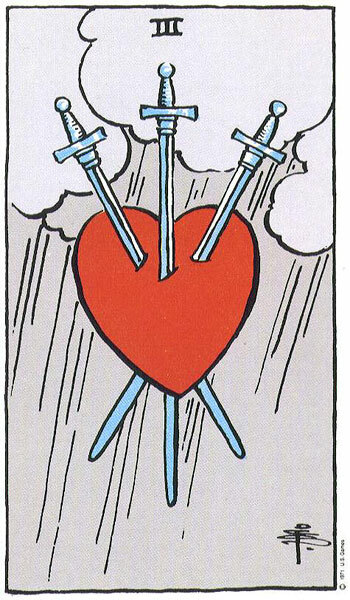 The next card is the Three of Swords- this one has kind of an iconic image attached to it, shown here- the heart, pierced by three swords, often with rain clouds forming a backdrop. It's interesting to note that the heart was often considered to be the seat of reason as well as the spirit in the ancient world, dating back to Aristotle. The Swords, as we know, are primarily symbols of intellect, reason and thought, as well as communication and ideas. 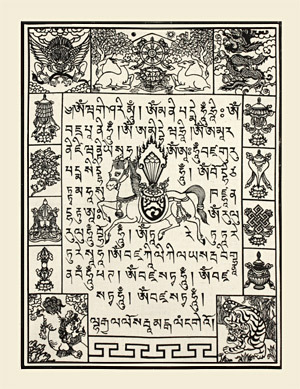 So from this we can assume the heart shape to be symbolic of that very same center of reason and emotions, yet it seems that reason, ideas and communications have turned on us- instead of wielding the swords of our intellect, these blades turn and pierce to the very core of our being. 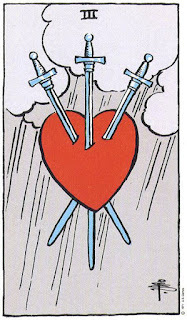 Hardly a pleasant message, it seems that the balance indicated in the Two of Swords has not come to a happy conclusion. The balance has been upset, and the results are painful. But at the same time, though this card indicates a time of painful thoughts, communications or realizations, the good news is that it's moved from an unknown to a known- nothing left to fear, no uncertainty. It's as bad as it's going to get. And also, here we have a message of moving forwards- what lessons does this sorrow teach us? It's a call not to dwell on the negative, as well- remember, we've gone from unknown to known. What can you do with that knowledge? 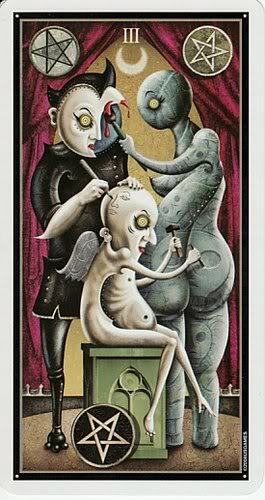 Next up is what seems to be the Three of Swords' polar opposite- the Three of Cups. Here we see the next evolution of the Two of Cups- the Two, dealing with a union and partnership, has proved successful and fruitful. The two people toasting each other in the Two, it would seem, have gotten together, perhaps a real or symbolic marriage, and now there's a cause to celebrate. The message here is, again, evolution- beyond the partnership of the Two, the relationship has evolved into something more- a partnership, a unit in one sense or another. Seeing as the Cups are tied to spirituality and emotion, often a new relationship or a marriage- this card can also indicate the likelihood of children in a marriage. 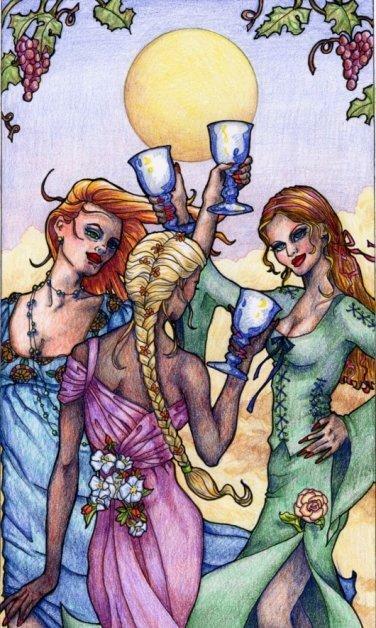 This particular image comes to us from the Epilogue Tarot, and it almost seems like these women are enjoying the first wine from a vineyard. The work and harvest has paid off, in this case an increasing depth and joy in a relationship or life path. Finally, we come to the Three of Pentacles- here, again, we find a sense of movement from the Two of Pentacles, indicating a time of balance, to things getting better- that balance that was maintained in the Two has come into the Three as success, and continued effort. This particular rendering comes from the Deviant Moon Tarot, and shows a kind of interrelatedness in the Three. In many renderings, we see an architect, mason, or some type of craftsman. The craftsman is depicted working on some task, while others, presumably his employers, look on approvingly, and discuss his work with a pleased eye. Here we see a similar message- that putting resources to work generates new projects- the more we work, and the more diligent we are, the more returns we'll see. One might say, it's a sense of creating our own future through our own efforts. The message is, nonetheless, to take advantage of the tasks ahead- to work hard, and be rewarded for that hard work. Again, we see that if we fail to take advantage of this, the decision is often made for us. But here we see the formation of a new foundation, in a manner of speaking. What we find is that our continued success builds up, and opens the way for new endeavors. What we put our energy into is what we receive back from the world. Overall the Threes indicate development and change, and through this change, a way either through trouble, or on to a better place. But nonetheless, keep in mind that in this life, change is about the only constant, as a drill sergeant once told me.